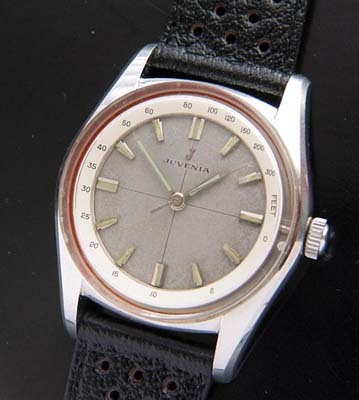 Uncommon depth scale indicator on this vintage Juvenia watch. 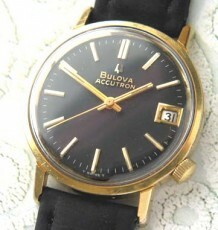 A near new old stock vintage watch by Juvenia. 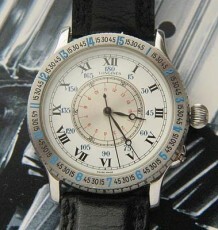 This unusual watch appears to be a diver’s sport model called the Juvenia Nautilus, with a mechanical depth indicating ring on the outside of the dial. The depth ring is in a high contrast white against a flat gray inner section of the dial. Also included in the center of the dial is a subtle cross-hair pattern which divides the dial into quadrants. The heavy steel caseback features an etched image of a Submarine with the words Juvenia and Nautilus. The movement fitted in the watch is a Juvenia calibre 664 which appears based on an ETA movement from the 1960’s. I have not seen this model before and certainly ranks as one of the more unusual models I have come across. 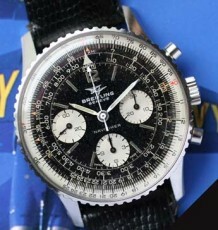 Many watch collectors are familiar with the brand Juvenia as they are well known for making quality watches, however mostly dress watches. 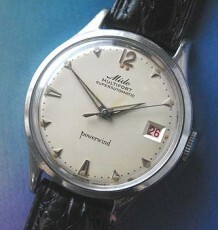 I once again point out the near new old stock condition of the watch, as it appears unworn. The movement was been serviced by my watchmaker to ensure it keeps great time. The case measures 36.5 mm wide by 45 mm long and is supplied on a black or brown leather strap.